I keep trying to wrap my head around what a complete business structure looks like. Many people settle for a functional view, e.g. development, marketing, sales, operations, etc. This is insufficient, first because it’s open loop (i.e. it doesn’t explicitly capture the effects of business actions on the market), but mostly because it focuses on the tactical at the expense of the strategic. In business, as in war, the typical outcome of this bias is a lot of dead bodies1. My current sketch of a complete business is shown in the diagram below. My observation of successful scalable businesses is that they understand the need for all of these functions and the necessary relationships between them. The general way to read this diagram is that the larger, stand alone text elements are nouns (objects) and the labeled arrows are verbs. The downstream objects are produced by applying the verb or verbs pointing to it to the upstream objects that the verb is attached to2. Note also that this describes a closed system with three feedback loops. This is very informed by military analogies. Whatever you may think of the military and war they’ve been refining their structures and processes for several thousand years. There’s a lot of insight to be gained by examining what has been learned. The process begins with some sort of situational awareness (e.g. there’s a city that has something I may want and they’re lightly defended). This is transformed into an objective (e.g. I will conquer that city). This provides the direction needed to begin developing a strategy (e.g. we’ll capture their water supply forcing them to surrender). Strategy provides a means for selecting tactics (e.g. break through the west gate and setup a perimeter around the well). A battle plan is developed, the military force is provided with the necessary skills and supplies, the battle plan is executed, some form of result occurs (the product). The occupants of the city react to the impact of the action. This reaction is detected by whatever means (instrumentation) has been put in place to evaluate results and changes in the situation. Based on the feedback the objectives may have been met. If not then either the strategy is adjusted or the objectives are adjusted. If adjustments are made then the cycle begins again. In the real world, of course, for both war and business it’s not nearly so cut and dried, but this provides a general outline on which organizations and processes can be constructed in order to achieve particular outcomes. Good comment, Eric. A couple of things come to mind. At the business tactic level people (skills) are a supply chain concern. Hiring the right people to implement various aspects of a business tactic (often a product) is critical. 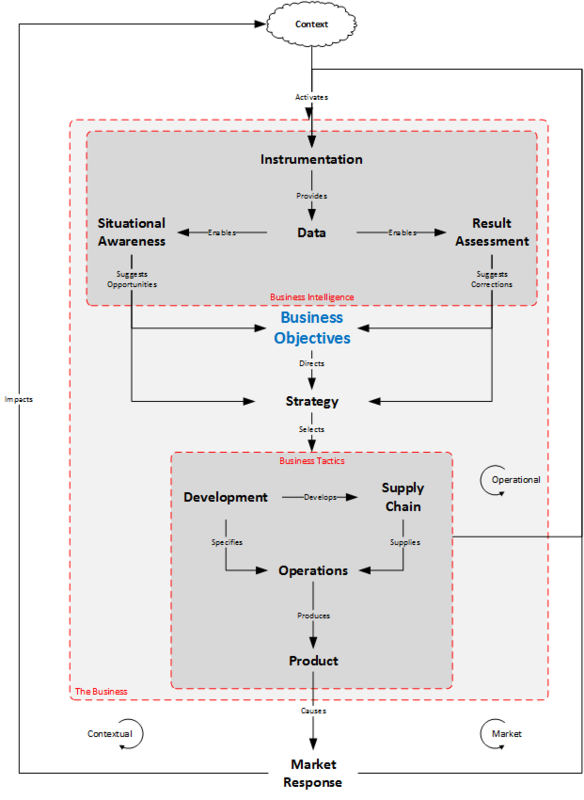 If you combine this with Michael Gerber's thinking in the The E-Myth Revisited where, for an entrepreneur at least, the business is the product including the product delivery system you end up with a more recursive, essentially fractal, model for operating and growing a business. The initial seed of a business is the entrepreneurs themselves crafting and staffing roles in their business structure. If successful this eventually grows into the large complex organizations that we know and have mixed feelings about. Nice drawing. Seems like there needs to be a "people" loop. The business objectives should drive (or could be constrained by) the capabilities of the people in the business. The people loop would include recruiting/selection and development.